Werner Herzog’s “Meeting Gorbachev” debuted to strong reviews at the Telluride and Toronto International Film festivals last fall, including from IndieWire’s own David Ehrlich. The film will be released by The Orchard and History Films on May 3, and now IndieWire exclusively debuts the first trailer for the film, along with its first poster, and a Q&A with Herzog, who co-directed the film with André Singer, himself. Ever the iconoclast, he praises President Trump’s efforts to negotiate with North Korea, saying, “I am not in favor of the demonization of Trump,” and, unprompted, talks about his “real small role” as a villain in the upcoming Disney+ Star Wars streaming series “The Mandalorian.” In other words, it’s exactly what you’d expect from a filmmaker who always delivers the unexpected. Watch the trailer below, followed by edited excerpts from the conversation. Your films often have a sense of awe about them but rarely awe for a particular person. Why does Mr. Gorbachev command that level of respect and admiration from you? There are obvious reasons. Number one, he’s a towering figure of great historic dimension for the last part of the 20th century. I do not see anyone of his stature at that time and of such momentous political events and historical events that he, in a way, triggered. He seems to be undervalued in the U.S., wouldn’t you say? Yes, that may be. That may be. However, I think when Gorbachev was in the United States for the last time … and that must have been at least 15 years or so ago, he still had a huge following among the students. Let’s put it this way, his historical role is undeniably there, and there’s something extraordinary about him, but I personally love him for his role in the reunification of my country of Germany. And what I had done, and he actually knew that when we had our first conversation, I had traveled on foot around Germany [in the lead-up to the fall of the Berlin Wall], always following the border line, all the way into the mountains, up and down, because politics at that time had pretty much given up on the reunification of Germany and I thought only our culture holds us together: only the poets will hold it together. He was impressed by that fact. And for me when the Wall fell and when Germany became reunited, that was an extraordinary moment in my life for me because it was beyond politics. It was something bigger than politics. You say at one point in the film that Mr. Gorbachev is a tragic figure. Do you really believe that? Well the film doesn’t go deep into it, but tragic in such a way that there is a good segment of the Russian public that sees him as a traitor. And that is truly tragic. But I have noticed that the climate is changing vis-à-vis Gorbachev. Taxi drivers [in Russia] speak much warmer about him now than a year and a half ago. So your sense is, it’s shifting, and I’m very glad about that. Your films are usually perceived, rightly or wrongly, as being very existential and philosophical, but rarely political. Do you think that’s fair? Certainly. Yet this film certainly is political, but very much of it is also beyond it. It tries to look beyond politics. What I’m trying to portray also is the man, what kind of a wonderful man is he. It’s about his soul and in a way more so, I try to have a few glimpses deep into the soul of Russia. And you see it, for example, when he meets his old aunt [in his hometown village] who is blind and you get the feeling this is a wonderful quality of Russia itself, this depth. This depth of emotion and depth of literature and culture. What do you think of all the rising anti-Russian sentiment in the U.S. right now? I think it is a mistake to demonize Russia. We have to look at Russia in the way we looked at Russia when Gorbachev was around. And I do believe that we should improve relations with Russia and I’m speaking “we,” I’m speaking of Europe and you have to talk about the United States. —yeah, but that would be really cheap. It would be a cheap sort of side event to comment on Trump’s Presidency and Putin’s Presidency. That’s not what the film is about. Do you think that there are lessons that we can learn from Mr. Gorbachev that speak to this particular moment? Or that things in particular that Mr. Trump and Mr. Putin could learn from him? For God’s sake, do not speak about “what could they learn” as if Gorbachev had been a teacher, as if he could encourage them to learn as pupils. No, Trump is the American president and we have to take it as a fact. And by the way, I’m not in favor of the demonization of Trump either. When you look, for example, his initiative with North Korea, that’s an extraordinary thing, and he’s trying to defuse a very, very dangerous situation. So it would be easy, and it would be cheap, to extend Gorbachev into today’s likes or dislikes of politics and likes and dislikes of presidents of America and Russia. I’m not into this business. You say that to connect the dots too much to the present moment would be cheap, but it feels so much like everything is political in our culture right now. What do you make of that? Let me not go into any diatribes about the current political situation. It’s not the meaning of the film, and I’m a guest in your country, and I like your country very much. That’s why I live here and that’s why I work here. So you will not get me into any kind of superficial discussion about current politics in the United States. This is a film made in part with History Films, which is part of a TV channel. What do you make of the streaming versus theatrical exhibition debate that’s consuming the industry? You could even watch it on your cellphone. But a film like that doesn’t belong there. And the beauty is that it will be released theatrically early in May. So I’m really looking forward to that and eventually it will be streamed. That will come. And it’s good to watch something with a few friends or family members on your plasma screen at home. Nothing wrong about that. You used some more kind of cutting-edge techniques in this film. How important do you think it is to keep pushing the form of the documentary? Well, I think we’ve got some wonderful tools, new tools that we didn’t have before. Drones is one of the most phenomenal achievements of the last years, and we do have cameras where it can film a person at night and even see the stars in the sky at the same time. So we do have cameras of extraordinary sensitivity, and those are tools that are really, really pushing the possibilities, not only of documentaries, of cinema in general. At the same time, this is probably the documentary you’ve made that relies the most on talking head interviews. What was the challenge for you to make that kind of format really cinematic? There was no alternative because Mikhail Gorbachev is ailing. He doesn’t really … I would have loved to walk with him across Red Square in Moscow but he can barely walk. He’s ailing. We only could do sit-down conversations. And we immediately connected somehow. Have you stayed in touch with him since the end of your interview? Yes, we actually have. I wasn’t there, but we showed him the film and he, against the advice of his doctors … he was on some intravenous drip and he took it out himself, jumped into an ambulance, and came to the theater in Moscow and saw the film. And was greeted by a crowd with great enthusiasm. He saw the film and he said by far the best that was ever made on him. So I’m very proud of that. You talk quite a bit about your hesitation to meet with him at first. In that kind of situation, do you ever worry that maybe you make your documentaries too much about yourself? No, there’s hardly anything about me in the film. It’s just my opening declaration. I have to out myself as German as I said and it was more like a joke. “Probably the first German that you ever met probably wanted to kill you.” He said, “No. No.” And explained so that’s basically all I’m saying. I never tape interviews. It’s really conversations. And because it is conversations — not like a journalist where it’s a catalog of questions — it was a free floating conversation where I was of course very well prepared and I could move in any direction that it would take. I’m really intrigued by your acting career in recent vintage. Yes, I did some more now. Now this is not a secret anymore, a small part, real small part, in “The Mandalorian,” the Star Wars sequel or whatever you call it. I like to do it because I know I’m good on screen, but only if I have to play a real villain. But let’s not speak about my acting and whatever. We’re here for Gorbachev and the imminent release of the film in theaters. It’s the right moment because it points to a time where America and Russia or Soviet Union were in a dangerous, dangerous confrontation, and the spirit of too men who were seemingly incompatible. Reagan and Gorbachev created a new world order or helped to create a world order that was extraordinary. That’s one of the reasons why I’m very glad that the film will be shown to a larger audience in the United States. And as I said, I like and love your country and I wish I can be part of creating a climate that would appeal to the best moments between America and Russia. 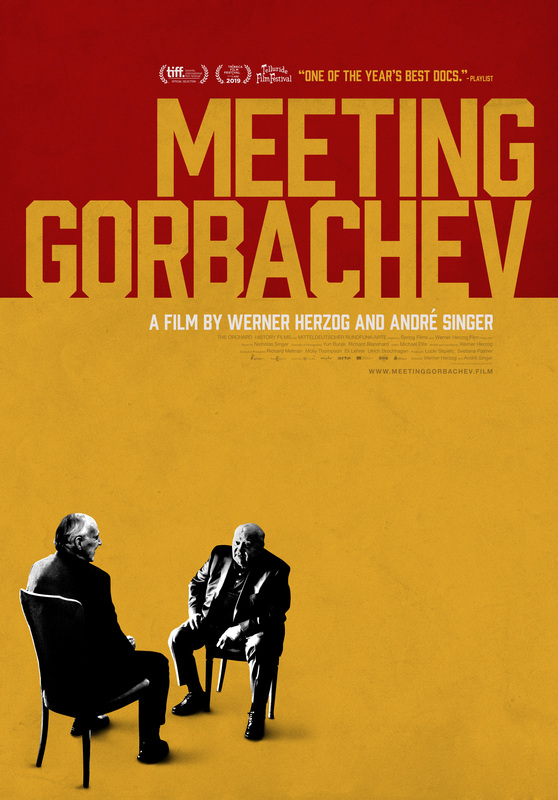 “Meeting Gorbachev” will be released by The Orchard and History Films on May 3.